While Ajitha's death was a very sad one and there are no reasons to suspect any foul play, it is time for us to introspect and move on. I have been associated with Nirmukta before the site was started and I think I have been the most prolific of the contributors to the site. Ajita had contacted me about Premanand at the time when he was seriously ill and was not to survive for long. We wanted to build up the movement and involve the younger generation too. So, this web site was his brainchild. I was sceptical about it but wanted to give it a try. So, I started sending him reports regularly and also involved many others too. So, the group grew. We also started the freethinker groups. He had plans to support FIRA (Federation of Indian Rationalist Associations) and join my tours etc. Though he came to India and it did not happen. But, he was in touch and the posting continued. 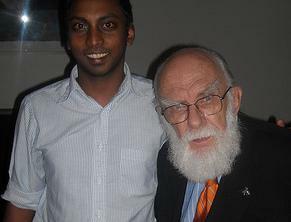 I have had some telephonic conversations with him and have met him personally only once at the Chennai Thinkfest. He said he would attend Mukti the program we planned for Mangalore but did not turn up. I had sent him a write up about Madesnana which was not put up. I had sent it to him again thinking that it was perhaps missed. There was no reply and I had the first inkling that there could be something wrong. This was confirmed when I had calls from Prabhakar, Aravind, Bala, Ganesh, Geetha and others. As I have already said it is time for us to introspect why this has happened. The grass root level movement will not be affected in any way as most of these organisations are not e savvy and are more into working with the people. The web community and the freethinker groups may be shocked and may be some are dazed. But, it is time to move on. We have to think of effective ways to keep Nirmukta going and build up the movement. That would be the best tribute to him. Many groups have many ideas and we should have discussions on these things as to how to achieve this objective and also perpetuate his memory.